Sri Krishnas form is His self, and His self is His form; there is no difference between Sri Krishnas self and His form. The form of Sri Krishna is the very form of the condensed principle of eternality, cognizance and bliss (sac-cid-ananda). Therefore the impersonal Brahman, which is the formless, diluted sac-cid-ananda-tattva, is merely the bodily effulgence of the aforementioned condensed sac-cid-ananda-tattva Sri Krishna, while the thumb-sized form of Paramatma situated in the hearts of all living beings, who is the universal witness and regulator, is a partial expansion of that Supreme Absolute Truth Sri Krishna. Thus, the concentrated sac-cid-ananda form of Sri Krishna is beginningless and without origin. He is the origin of Brahman and Paramatma. kṛṣṇas tu bhagavān svayam means bhagavatva, the authority of Bhagavān, is fully expressed in Kṛṣṇa, not in others. 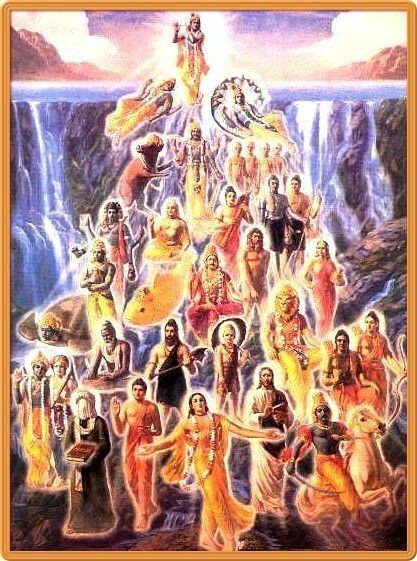 Therefore in the Śrīmad-Bhāgavatam it is said... After making the list of different incarnation, it is summarized that ete cāṁśa-kalāḥ puṁsaḥ kṛṣṇas tu bhagavān svayam: (SB 1.3.28) "All these incarnations mentioned," rāmādi-mūrtiṣu kalā-niyamena tiṣṭhan (Bs. 5.39), "they are partial expansion and expansion of the expansion or expansion of His power, śaktyāveśa-avatāra." 1. Lila-madhurya: He exhibits numerous wonderful pastimes for the pleasure of His devotees. 2. Bhakta-madhurya: He interacts with loving devotees in intimate ways. 3. 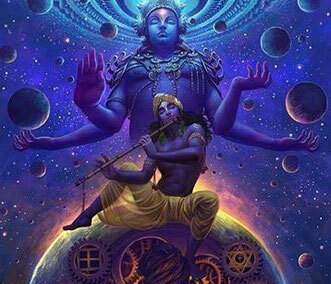 Venu-madhurya: He plays on His divine flute, thus attracting all souls. 4. Rupa-madhurya: His beautiful form is incomparable, unrivaled in all of existence. Embedded in these scriptural explanations of Krishna's supreme position is something more fundamental: Krishna's supremacy underscores the superiority of love over power, sweetness over opulence. So, from an impartial study we can see that Krishna’s pastimes are more sweet and enchanting than those of Vishnu. In that sense, Krishna is superior to Vishnu. 1.Lila-madhuri—He is the performer of wonderful varieties of pastimes (especially His childhood pastimes). 2.Bhakta-madhuri—He is surrounded by devotees endowed with wonderful love of Godhead. 3.Venu-madhuri—He can attract all living entities all over the universes by playing on His flute. 4.Rupa-madhuri—He has a wonderful excellence of beauty which cannot be rivaled anywhere in the creation. Kṛṣṇa who is known as Govinda is the Supreme Godhead. He has an eternal blissful spiritual body. He is the origin of all. He has no other origin and He is the prime cause of all causes. This starting verse of Bramha Samhita itself proves that 4-handed Vishnu form came from 2-handed Shyamsunder Krishna form. Lord Krishna first expanded himself into Vasudev, from Vasudev came his immediate expansion Baldev or Shnakarshan and from Shankarshan came Pradyumna and Anirrudha to form the quadruple Narayan or Vishnu expansion holding the Lotus flower, Sudarshan wheel, Conch and Mace in his four hands. Lord Krishna at the time of his birth revealed to Devaki and Vasudev his 4 handed Vishnu form and told himself to be transferred in his 2 handed baby form to Gokul. Lord Krishna first revealed Arjuna his Universal cosmic form and then his 4 handed Vishnu form from which he finally showed his 2 handed form of Krishna which is liked devotees.